Thomas L. Hartsell Jr., JD, is an attorney and mediator in private practice in Dallas, Texas. He is a frequent workshop presenter on topics related to ethics, managed care, confidentiality, informed consent, abuse allegations, and other legal aspects of mental health practice. Barton E. Bernstein, JD, LMSW, is an attorney in private practice in Dallas, Texas, and a Licensed Master Social Worker. He conducts workshops and seminars throughout the United States. 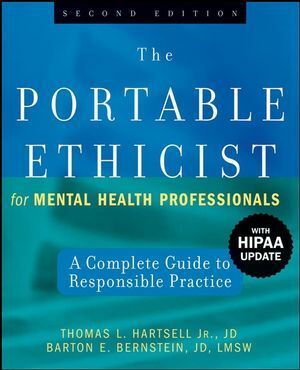 Together, the authors wrote the first edition of this book and its two companion volumes, The Portable Lawyer for Mental Health Professionals, Second Edition and The Portable Guide to Testifying in Court for Mental Health Professionals, both published by Wiley. 6. False and Misleading Statements. 11. Repressed and Recovered Memory. Part II: Ethics Codes and Licensing. 14. Areas of Ethical Complaints. 15. Ethics Codes as Evidence. 17. Office of Civil Rights. 18. Centers for Medicare and Medicaid Services. 19. Reporting Statutes and Obligations. 22. Closing or Interrupting a Practice. 23. Kickbacks, Bartering, Fees, and Gifts. 26. Drug and Alcohol Use, Impairment. Part V: Special Therapy Considerations. 33. Don't Do Dumb Stuff. Epilogue: Ethics in the Twenty-First Century. Appendix A: Mental Health Professional Organizations. Appendix B: Allied Healthcare Providers Professional and Supplemental Liability Insurance Policy. Appendix C: Social Workers Professional Liability Claims-Made Policy. Appendix D: Sample Jurisprudence Exam Questions. • A new chapter on dealing with dangerous and problematic clients. • A new chapter on avoiding complaints or malpractice suits by using dispute resolution alternatives such as mediation, conciliation, or arbitration. • New material on the HIPAA Privacy and Security Rules integrated throughout the chapters. • A listing of useful web page addresses including links to all the ethical codes for all the national mental health organizations and state licensing boards. Written by two attorneys specializing in mental health (Bernstein is also a clinical social worker). Licensed mental health professionals are obligated to complete a requisite number of hours of continuing education as a condition of licensure which includes a set number of hours on ethics training. Required course in many psychology, counseling, and social work programs. Filled with icons and call-outs for easy reference.